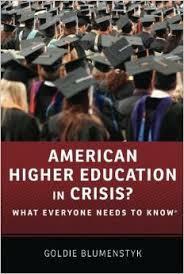 In her new book, “American Higher Education in Crisis?” Goldie Blumenstyk, senior writer for The Chronicle of Higher Education, argues that our system of two- and four-year colleges, public and private, is at a tipping point. Demographics are changing, costs are rising and distance-learning poses a threat to the traditional model. A look at the future of higher ed. With production assistance from former Midday intern, Kerry DeSantis.